The Trainer PWNS the Crypto-Thing! Order a pizza and say, "Make Me One with Everything!" OK. . then I'm lost. . . second line. . . bootson? 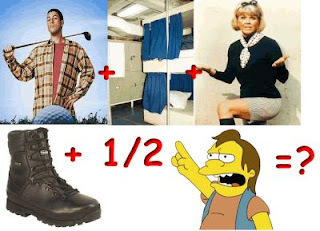 Bootnel. .
Shoe Muntz. . . arghhhh. . good thing I can fly a damn plane for Uncle Sam. Oh. . crap. . trainer beat me to it.